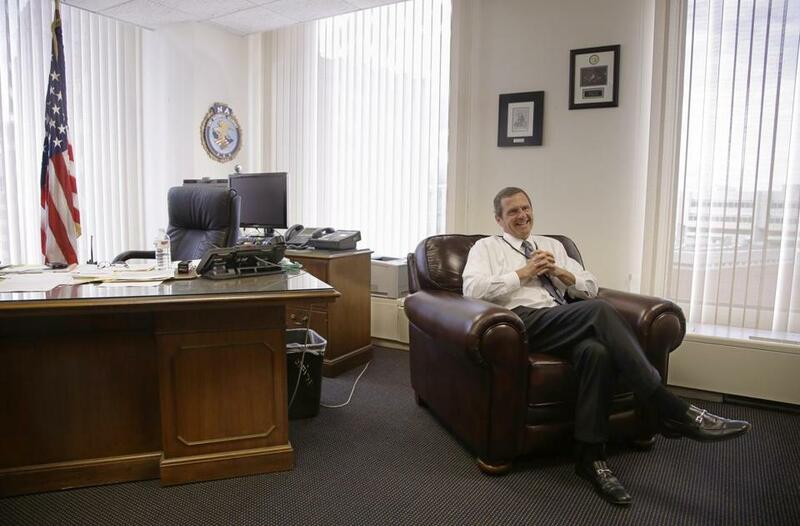 Vincent Lisi is the newly appointed chief of the FBI office in Boston. The new head of the FBI in Boston said the investigation into the Marathon bombings is ongoing and a priority, as he begins to learn the lay of the land less than two months into his assignment. Lisi, 49, was named head of the division on July 24, the latest assignment in a career that began in 1989. Having originally worked as a public accountant, he has investigated violent gang and drug crimes in the FBI’s Washington field office, has been stationed in Yemen, and most recently served as deputy assistant director of the Counterintelligence Division at FBI headquarters. Lisi, married and originally from Pittsburgh, said he is still canvassing the Boston district, which has 10 offices in four states: Massachusetts, Maine, New Hampshire, and Rhode Island. He also said he is working to meet the FBI’s partners in law enforcement, at the state and local level. But Lisi, who saw a new partnership forged between law enforcement officials following the Sept. 11, 2001, terrorist attacks, said he is seeing the same thing happening in Boston. “I get the sense that . . . everyone here is closer together,” he said. He would not comment on details of the Boston Marathon bombing investigation, including a secret grand jury that heard testimony last week from in-laws of suspect Tamerlan Tsarnaev, who was killed in a gunfight with police. Tsarnaev’s younger brother, Dzhokhar, is in custody and has been indicted in the attack. Lisi inherited the FBI’s internal investigation into the bureau’s questionable use of New England Mafia captain Mark Rossetti as a secret informant. The bureau ended its relationship with Rossetti, who has been suspected in several murders, after learning that he was under State Police investigation for running an organized crime ring. Lisi said the FBI is finalizing its internal affairs report, but he said all indications are that the bureau followed its regulations. Meantime, Lisi said, the bureau is pursuing other investigations. He said a priority would be capture of terrorism suspect Ahmad Abousamra, who is reportedly in Syria. His codefendant, Tarek Mehanna of Sudbury was convicted of conspiracy to aid Al Qaeda and other charges and sentenced in 2012 to 17 years in prison. Lisi said he also wants to reach out to partners outside law enforcement, in the technology and communications industry and in academia, for instance, as part of a national trend to investigate computer and financial crimes. But being from Pittsburgh, he can’t cheer for the Patriots, or the Bruins. “There’s no way,” he said. Correction: An earlier version of this story misstated the four states in the FBI’s Boston district. They are Massachusetts, Maine, New Hampshire, and Rhode Island.